Some of you may already know this, but I am a fanatic for Latin music, Afro-Cuban styles in particular, and most especially the bongo drums. When I first started teaching myself about this range of music sometime around 1997, I looked for records that well-known Latin musicians regarded highly, records that influenced them in their careers. 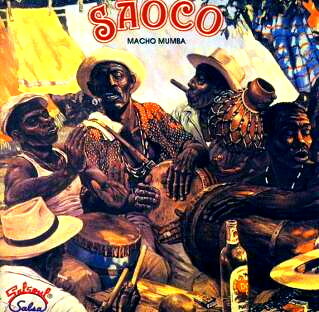 One person suggested the 1978 album “Siempre Sere Guajiro” by Saoco, calling them an “underground cult legend of New York salsa”. Of course I had to buy it. This album blew my mind. It has some of the tightest rhythm ever, especially from the horn section. The arrangements are “open” enough that you can hear every individual instrument, but still rich and full of complexity. The lyrics are colorful and culturally deep. And the singer—what a voice, and what nuanced phrasing! That singer is Henry Fiol. It turns out he also directed many of the creative choices of the band at that time, and he even painted the album cover art (as well as the covers of some of their other records). It also turns out he was very dedicated to his own vision of how the music should be performed, to the point where he had a falling out with the co-founder of Saoco, and they parted ways, with the other bandleader keeping the band name. From that time, Fiol recorded under his own name. His style relies heavily on traditional Cuban folkloric flavors and lyrics, with no modern electronic additions, no trap kit drums, and no jazz, rock, or disco elements—yet with an urban sense of urgency, and a soft spot for vocal doo-wop as sung on the street corners of New York when he was young. Saoco’s music influenced me hugely at that time, and it informs my tastes to this day. I wanted to hear more from this band and this singer, but it wasn’t until a couple of years later that I found more of their long-out-of-print records released on CD. And during that time I had read comments from other musicians saying that Fiol was difficult to work with because of his very particular artistic vision, and that he had been shut out by some of the powerful figures of the Latin music recording world in New York, people who control the record labels and the contracts of the performers. At that point I assumed we had heard the last from this iconoclastic artist. But then in 2004 he released a new album entitled “Guaperia” on his own record label; and in the liner notes for that record, it is made clear that he did not stop recording or performing over the years, and that his successes during that period were mostly in Central and South America. But even knowing that he was still active, it did not occur to me that he might have a presence on the internet, because his aesthetic is so strongly based on old-school music, and because I associated him with an artistic peak in the 1970’s. This assumption was especially foolish of me because his email and web addresses are also in the liner notes of “Guaperia”. For several years I lost track of the Latin music world, pursuing other interests—but here in 2010 I thought to myself “I wonder what Henry Fiol is up to these days”, and Googled him. It turns out he not only has a website, he has a new album up on that site, free to download! I almost cried from happiness. http://www.henryfiol.com Hearing this record, and seeing that Fiol is still active and doing great things, has renewed my excitement to be involved in Latin music, and inspired me to pick the bongos back up. There are other records by Fiol and Saoco, but many of them are out of print and very hard to find. However the beautiful music within is worth the hunt, and the price! 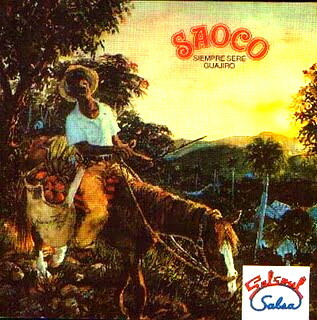 If you can only buy one, get Siempre Sere Guajiro—one of the best tipico salsa albums of all time. Should Henry happen to find and read this page, I offer him my deepest respects, regards, and thanks. This is great, thanks Cyrus….another thing we seem to have in common. I DID happen to read this page, as you say, and I’m most grateful to you for your interest in my music and also for the kind words. It means a lot to an artist to know that there are people out there, like yourself, who appreciate one’s efforts; it’s fuels my creative engine and keeps the ball rolling. I assume that the free-download album you refer to is “De Cachete”–the first. Well, since that time I’ve recorded 2 more free-download albums: “Salsa Subterranea” (Underground Salsa), and our newly released “Ciudadano del Mundo” (Citizen of the World). I hope these recordings will please you, and also inspire you to pick up the bongoes again. Wow! Thank you Henry, I’m honored—and I can’t wait to check out those new albums!